The management of the state enterprise “Myrnohrad”coalmine received a letter from the Pokrov inter-regional department of the Security Service of Ukraine in the oblasts of Donetsk and Luhansk. The correspondence contains a directive to urgently inform the SBU about the activities of local independent trade unions of miners of Ukraine. 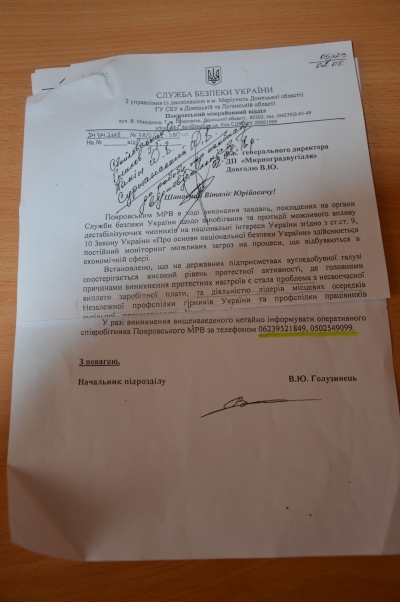 The organs of the SBU have demanded that employers give them information about the activities of the trade unions including holding meetings, conferences and other preparations/measures, like the manifestation of intentions to hold protests in the mining community, the picketing of administrative buildings, strikes, the lowering of enthusiasm in the mines, hunger strikes etc. Mykhailo Volynets also mentioned that information about this initiative by the SBU against the Independent Miners Union of Ukraine has been sent to the embassies of the main states, and to the international organizations concerned with the issues of rule of law and of freedoms.